Does anybody know if/how the phone can create a wifi signal to teather? I have one of these but can't seem to find the answer anywhere! nokia 800 is completely a different phone.but compared with n9,n9 has gets the upper thumb. Because of its features and its simplicity. Anther problem is that that the OS is completely belongs to microsoft and not nokia. nokia is just provides the hardware backup for the OS to work just like microsofts other partners like dell, hp etc.When comparing with other phones lumia phones gives the user a completely different experience from its OS and stong hardware.And when compared to android its much simpler and fun to use.In the case of front camera and 3g calls i believe none of the windows7 supporting phones (samsung or HTC )has this features. And in the case of applications its just the starting. everyone is so underestimating this phone and what nokia and windows have done. I think.. in time windows will compete with apple, considering apple is on it's own. Think of what nokia and windows have achieved. Everyone loved the old nokia's, the durability and quality. Everyone used microsoft for their advanced software. This is only the beginning. This could be the future. AnonD-33682, 28 Dec 2011@pirate if u own a samsung focus then go and comment on its page. Why do you puke ur comments... morehonestly nokia WAS the best(good old days), but at this moment... damn it. all i need to do is to make sure that i doesnt come 2 realize samsung has swallowed the market when it is too late! In the age of 3G , Lumia is not providing front facing camera.. its really sad.. who designed Lumia that he forgot important feature.. never expect this kind of blunder from NOKIA.. Anonymous, 28 Dec 2011don't buy this phone, nokia n9 got the exact same design. and camera quality, battery life are... moredude, what app do you use for videocalls, cuz i cant find one, skype dont support videocalls on n9, also, the nfc only works with nokia nfc capable phones, there are very few of those on the street. the lumia has better procesor (two times faster) and better gpu (4 times faster). and no comments about the apps. hello, whatsapp means something to you? Corgis albedo, 28 Dec 2011why U peoples always quarrelling over such a pity things ? In democratic country like ours, e... morelol are you telling that the motorola phones are more durable than nokia phones? AnonD-33682, 28 Dec 2011@pirate if u own a samsung focus then go and comment on its page. Why do you puke ur comments... morewhy U peoples always quarrelling over such a pity things ? In democratic country like ours, everybody can freely expresses and share his/her own foolish opinions. To be honest ,me too prefers Motorola droid Razr xt910 over both current Nokia and Samsung products for possessing a solid durable body designed with max. functional capabilities . if u own a samsung focus then go and comment on its page. Why do you puke ur comments over here. U know y.. Bcoz u know nokia is best. And the design and build quality of Lumia 800 is far better than your samsung focus. And about apps windows market has already crossed 50000 mark in 2 months. Its just faster than android or ios. don't buy this phone, nokia n9 got the exact same design. and camera quality, battery life are better. this phone lacks front face camera, so no video calls or skype. go to iphone section and advertise der and solve problems..
r u paid any thing from apple??? if u r iphone and andriod phns fan. Then what the hel u r doing over here.. Why the hel r u miss guiding them who are interested in this phone.. This is just awesome. Its just far better than iphone. Its just the starting , just see what magic Nokia and Microsoft together they are going to do. And even android struggled in the starting for about 1.5yrs. It was galaxy S which made android popular. Just check out the figures Nokia has already shipped 40million LUMIA phns in the market. Nokia just thinks something different from others. Those who wanna buy this phone just go for it. Its too mind blowing i have used it. I'm gonna replace my N8 with LUMIA 800. 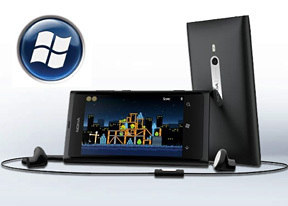 Total of 5690 user reviews and opinions for Nokia Lumia 800.